Many of you have been asking about the difference between all the different oats I use, how to cook them, what brand to buy, etc. I hope the following will answer all or most of your questions. I can do a follow-up if you have any further questions or comments. Whole oats are what come directly off the oat plant. They are inedible at this stage. The hull is the hard shell that encases the Whole Oat. This is removed from the Whole Oat + discarded or processed into oat bran. Oat groats are the whole oat grain that is left after outer hull has been removed. The oat groat can be cooked + consumed but it is more typically eaten in one of the forms below. Steel cut oats [aka Irish Oats] are simply the result of cutting the oat groat into a few pieces. There has been minimal processing up to this point. Eating steel cut oats will ensure you are getting all of the nutritional benefits the oat has to offer. 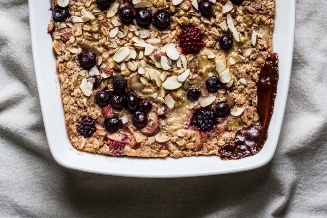 Steel cut oats take around 20min to cook, and result in a chewy + slightly crunchy bowl of oats. They also have a nuttier flavor in comparison to rolled oats. While the serving size measures out to half of that of rolled oats, the nutritional information is nearly the same. 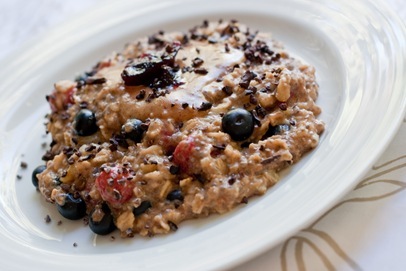 Scottish oats are a result of taking steel cut oats and grinding them into a fine meal. 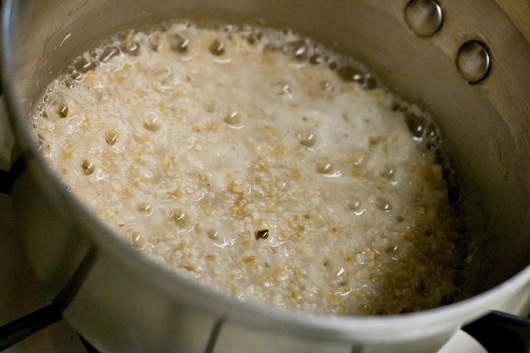 This produces a creamier, porridge-like, bowl of oats. These take around 10-15min of cook time. Both Scottish + Steel cut are more flavorful than rolled oats and I find that Scottish Oats are the most naturally sweet tasting oat. 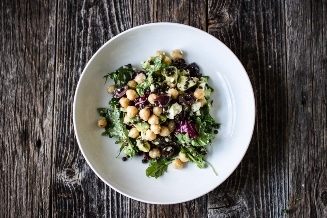 They also both expand much more during cooking, which makes up for what initially seems like a smaller portion size. These are the result of steaming + flattening the oat groat. Since the oat groat is steamed, it is actually partially cooked, greatly reducing your at-home cook time to around 5-8min. 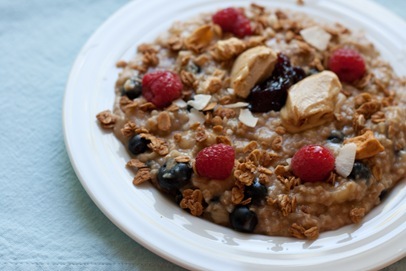 Rolled oats have a thick + chewy texture and need less liquid to cook than Scottish or Steel Cut oats. 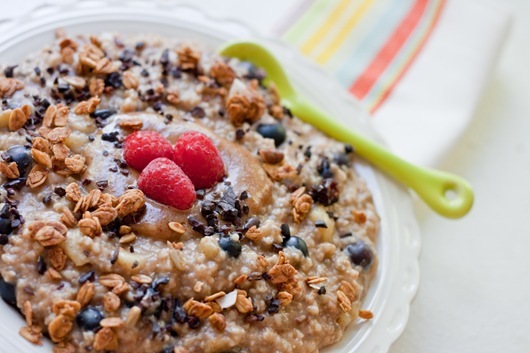 Similar to rolled oats, quick oats are steamed longer + rolled out even thinner. This makes them more processed but again, quicker to cook. 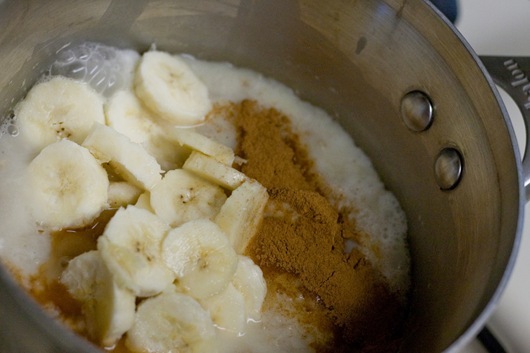 Quick oats can be made on the stovetop or in the microwave in just minutes. The outter shell of the whole oat is ground to a fine meal, making oat bran. 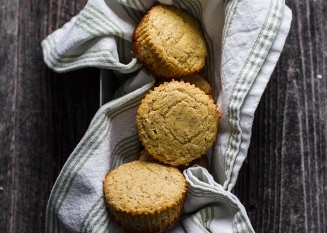 Oat bran is very creamy, cooks in minutes, and is high in soluble fiber. It is also much lower in calories than rolled, Scottish and Steel Cut oats. Oats that have been ground to a fine flour. 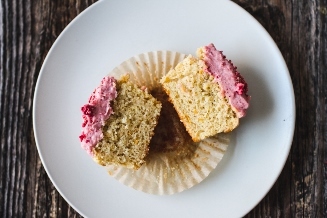 This can not be substituted for whole wheat flour as oat flour lacks gluten to bind baked goods together. *Nutritional facts all come from Bob’s Red Mill products. And now for a little tutorial on my most frequently consumed oat products. 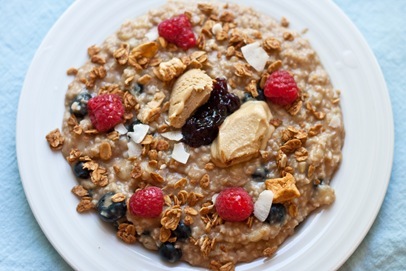 Rolled Oats – I used to be an “instant oats” girl until about 2 years ago. I never thought cooking on the stove top could possibly be worth it. I most frequently bought the Quaker Instant Oats – Brown Sugar packets. 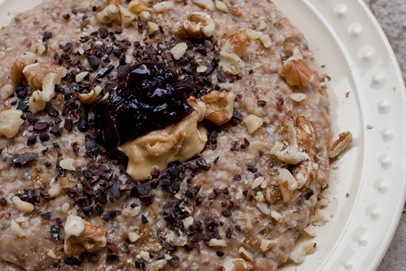 One day I decided to experiment with rolled oats and never looked back. There is no comparison to rolled oats. 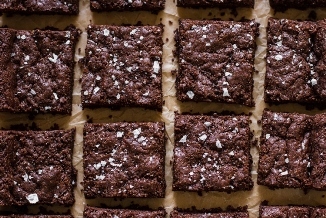 The texture + flavor are much better and worth the few minutes of extra cook time. When in a pinch, instant oats are better than no oats! Sometimes I take instant oats camping or eat them at hotel breakfasts. You do what ya gotta do! First, I start with the basic ingredients that I put in almost every bowl of oats I make. 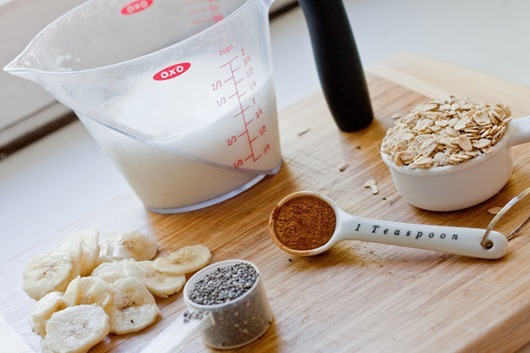 cinnamon – I use at least 1/2t in each bowl. There are a ton of amazing health benefits from cinnamon! sliced banana – Thanks to Kath for this brilliant idea. I always slice thinly and go back and forth from 1/2 – 1 whole banana depending on the size. 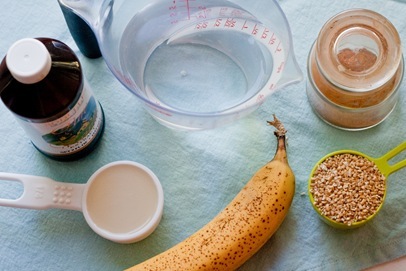 It adds a natural sweetness and makes the oats extremely creamy, along with all of the nutritional benefits of bananas! 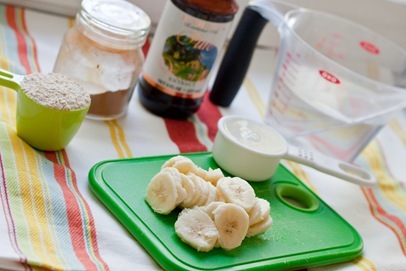 If you do not like banana, sub 1/4c unsweetened applesauce for similar effects. chia seeds – I use about 1T in almost every bowl. They help keep me full longer and are packed with nutritional goodness. On med/med-low heat add all ingredients together and whisk until combined. Bring to a simmer and cook for 5-8min, whisking occasionally, until desired consistency is reached. -If you realize you’ve left your oats on the burner a little too long and they are too dry and thick, just add a little more more milk or water, -whisk and let cook another minute. 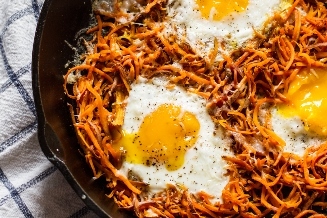 -For an extra protein kick, whisk in 1 egg white in the last 2min of cooking and let simmer. The oats will become creamier, fluffier and have a nice addition of protein. You may see small white pieces from the egg white but I have never noticed actually “tasting” it. -Whisking too much can cause your oats to become gelatinous + sticky. I try to stir as few times as possible. -In the fall + winter I LOVE adding in pumpkin puree to my oats. You can sub out the banana and instead add 1/3c pumpkin puree or add it in on top of the banana. I also add in other spices like ginger, nutmeg + cloves. When I stir in fresh berries, I do so at the very end, once the heat is off. It takes the cold bite off of the fruit but still leaves them with a great texture. 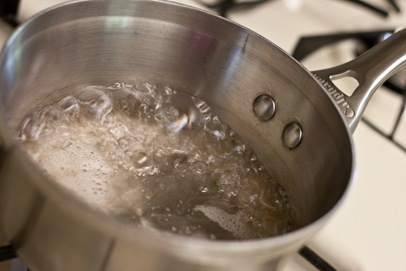 Whisk in the scottish oats and reduce heat to a simmer. After about 5-7min [varies depending on gas/electric and stainless/nonstick] when the oats are fairly thick, add in milk, vanilla, cinnamon, chia, and banana. Let cook for about another 5min until desired consistency is reached. 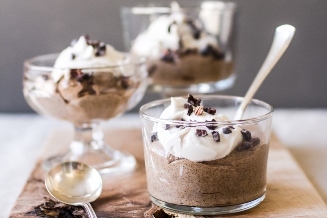 -Again, the chia seeds, cinnamon and vanilla are all optional. -If wanting to add 1 egg white, add it in the last 2 minutes of cooking. Whisk in and let simmer for 2min. I love making nut butter sauces, as it spreads around nicely on the oats. I am also currently really enjoying cacao nibs. 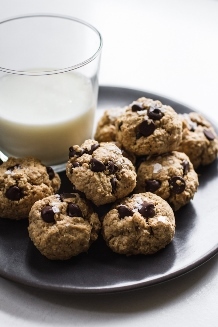 These are not like chocolate chips but have a great crunch + flavor along with nutritional benefits of their own. 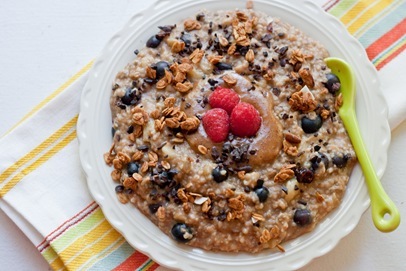 Steel Cut Oats – My 2nd favorite oats are Steel Cut. At my first 2 attempts, I did not like these at all. They seemed very gelatinous, but that was my fault! I really think the key is adding enough liquid, not stirring too much, and letting cook long enough. 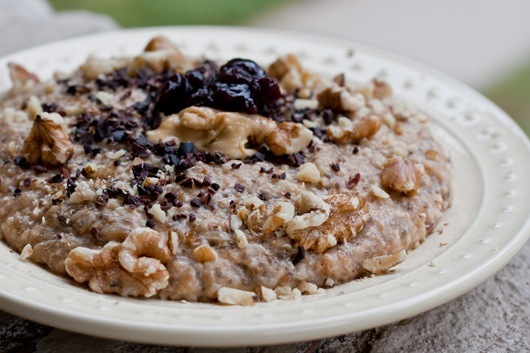 Steel cut oats have a great nutty flavor, and a creamy + crunchy texture that I love. These cook in a very similar way to Scottish Oats, except they do take a little longer. With all my talking about Steel Cut oats I got my dad to try them [an oat lover] and he loved them! These are the least processed form of oats [excluding the whole oat groat] that you will find. Again, you only need about 1/4c serving to fill you up like your 1/2c of rolled oats. 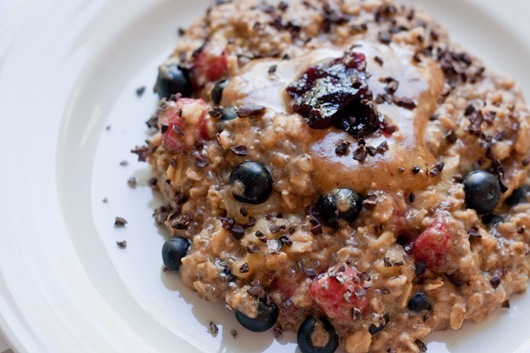 Whisk in the Steel Cut Oats [just like with Scottish Oats]. Let cook about 10-16min until most of the liquid is absorbed. 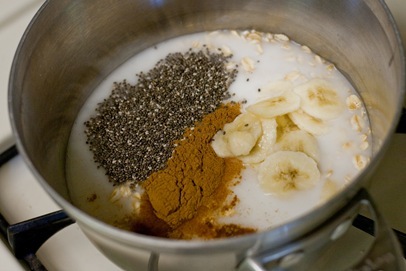 Add the milk, cinnamon, bannaa, vanilla, and chia at this point + whisk to combine. Result? A HUGE plate of oats. Compare this photo with the Rolled Oats photo on the same plate. Can you see the volume difference?? Scottish + Steel Cut produce a bigger volume of oats which I love. 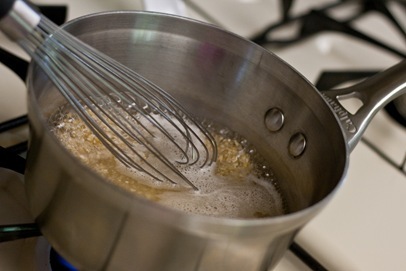 Whisk in the Steel Cut oats and reduce heat to a simmer. 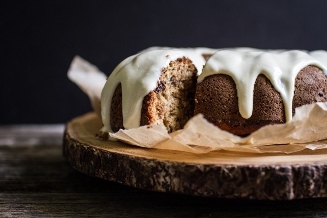 After most of the liquid is absorbed, about 10-17min [varies depending on gas/electric and stainless/nonstick], add in milk, vanilla, cinnamon, chia, and banana. Let cook for about another 5-7min until desired consistency is reached. This morning’s plate of Scottish Oats was deeelicious. Now on an un-oat-related note…. My parents sent us the most amazing thing everrrr. A cast iron panini press!!!!! Before I even got to use it, I got a text from Chris while I was babysitting saying: panini press = awesome. Yes, this is going to get the huz to cook more!! 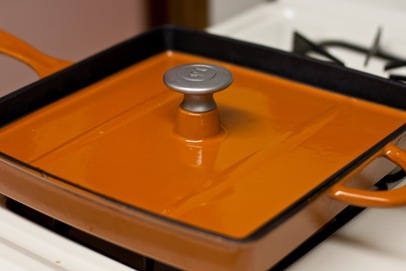 I am extremely excited about this and have wanted a panini press for some time now. Another reason for excitement is that this is a pan rather than another plug-in appliance. I will post more about this soon and the actual reason my parents sent it to us. There was a meaning behind it! Now when shopping I think, how can I make this in the panini press?? 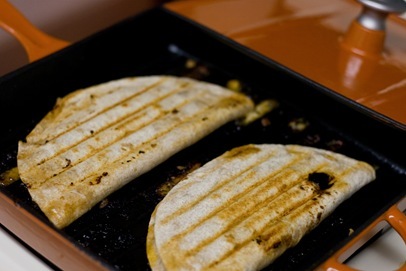 It’s not only great for samiches but any indoor grilling. I’m SO excited to use this as much as possible. Crumble tempeh and saute in a greased pan with any veggies + seasonings you like. I used organic bell peppers, cumin/garlic/chili powder/salt/cayenne. After the panini press was heated over med-low heat I added cheese + salsa to the tortillas then topped the tempeh mixture and a little more cheese [for sticking! ], folded in half and stuck in the pan. 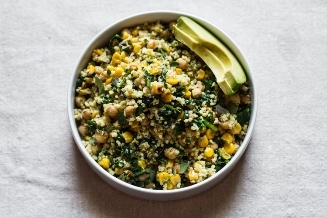 Smash with the lid, cook, flip + cook some more. 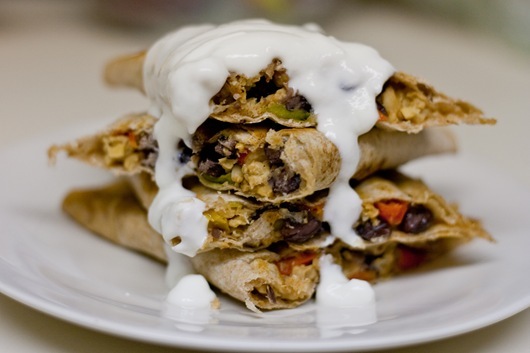 Topped with some plain yogurt. Flipping delicious. I hopped back on my bike today for a 16+ mile ride at the park. Came home and immediately did 20min Yoga for Cyclists from yogadownload. It was AWEsome to actually do this yoga workout right after cycling. LOVED it. Time to put this bod to bed….night! 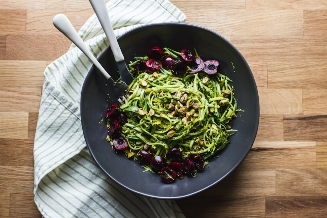 As if this post wasn’t long enough….I’ve updated my recipes page!! I’m pretty excited about it because the breakfast section is MUCH more organized and I added a few new categories like “nut butters.” The next step will be to add designations, such as: vegetarian/vegan/gluten free. Hopefully it’s easier to navigate now! Also updated is the VFF photo page.